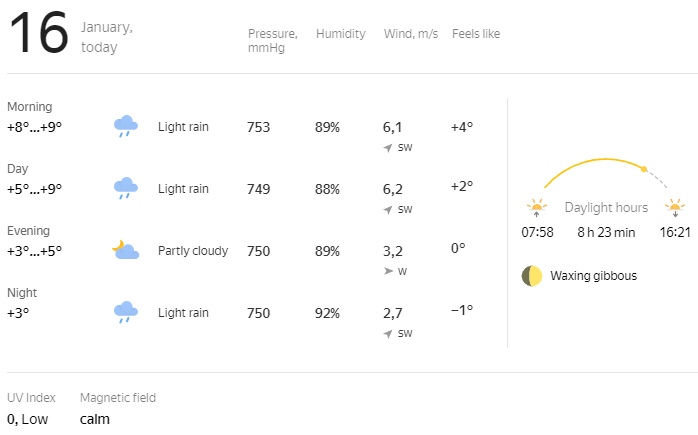 Detailed weather forecast for a given location at different times of day. Sunrise and sunset time, daylight hours. Water temperature (for places located near large water bodies). Magnetic field for the next three days. A forecast made for the next two days is most accurate. A forecast made for a period from two to five days is less accurate. A forecast made for a period from five to ten days may differ significantly from the actual weather. A forecast made for a period of 10 or more days reflects the region's climate normal over the past seven years. This is average and not calculated data.